The first suggestion we make is to read what we said last year about the month of Iyar. What will be said this year will build on what we said last year. Below is the link to last three year's Blog about Iyar. Please press your back button to return to this location after you read last year's Blog. One important fact to keep in mind: Every day in the month of Iyar is a day in which the Omer is counted. For this year that means all 4 weeks plus two days are days of the Omer, which is generally considered a negative period. There are positive days in Iyar as discussed below - yet they are few and far between. Iyar has the meaning of "breaking through of the Light." Iyar is also called Ziv which means Light or Brightness. The Name Iyar and Ziv imply great passion that is dormant and waiting for the right moment to break forth. Rabbi Nachtman of Breslov teaches that the best time to collect herbs for healing is during the month of Iyar. Iyar teaches us about "correct timing." We learn this from the Clouds of Glory who lifted to indicate time to travel in the desert. The first time that this happened was during Iyar. We also learn from the Holiday of Pesach Sheini that there is never a time that is lost that can not be regained. This hints to us about Teshuvah or "Return to HaShem." If we separate ourselves from HaShem we can always return; we just have to take the first step and persevere. That is what the Light of Iyar is about. It is the support to us no matter how difficult it appears. It will always be available to follow the process no matter how difficult it looks since the path we are on will appear comfortable. Attribute: Thought; Thinking; Reasoning הרהור - HirHur Think it through before you act is a good attribute; yet it also makes it difficult to start acting. This relates to the right timing of something. Thinking is an attribute of Binah. One needs to learn to sometimes let go of thinking and reasoning and listen to our intuition and our unconscious trying to speak to us. Ancient Tribal Connection: Shimon - שמעון Shimon is the Tribe that connects to Harsh Judgment. This comes from the idea expressed in the letters of his Name which is "Motion is my Name." This hints at reaction rather than pro action. When Levi and Shimon come together, the world can be destroyed. We must think before we act; yet Shimon does not do that. The Nasi of the Tribe of Shimon was killed by Pinchas who also did not think - Pinchas just did what was considered RIGHT. Usually human beings do what becomes wrong. Issachar- son of Jacob was a dweller in tents who studied Torah. The Tribe of Issachar was known as the discerner of times meaning that they were knowledgeable in calculating the time of the New Moons. He is supported by his brother Zebulon. There are 2 Shins (Sins) in his name. One is silent. One reason given for the silent Shin in Yissachar’s name is that he named a son Job. Later he learned this was a disgraceful name (name of a heathen god) so he gave his son a Shin from his name and renamed him Yashuv. Hence, his name is pronounced as if it were written with only one Shin (Sin). We learn this from the difference in the Torah Verses of Genesis 46:13 and Numbers 26:24. Both deal with the Sons of Issachar yet the Names are spelled differently. How does this help us to understand the month of Iyar? By making changes to Names after thinking the process through as described above. Tribal Totem: Fortress or Canyon נקיק A fortress like a canyon represents shelter and protection just as the feeling of protection that comes from the Light of HaShem. 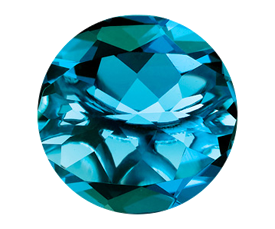 Tribal Stone: Topaz פטדה Pitadah The Topaz is described as the stone of the right side. It represents the flow of love, prosperity, blessing, gifts and healing. All of these represent the Flow of the Heart. Tribal Herb: Onycha צפורן Tziporen This herb is related to the idea of natural noises like the sounds of the ocean waves and the sounds of birds chirping. It is actually using the same Shoresh as the word for Bird which is Tzipor. These sounds of nature are a useful tool to settle the heart and the emotions. It is a good tool to utilize during Iyar - Meditation on the flow of the sounds of nature. House: Prosperity בית הממון Bait HaMamon Hamamon is cognate to the English word for Money. The sages have taught that money is a spiritual thing. They teach that a human being is composed of 4 aspects- Body, Soul, Mind, and Money. This is because money is truly part of someone's soul or it seems to be that way for some people who are willing to lose their lives over their money. As the Sages teach one who steals even a Prutah (coin similar to a penny) steals that person's soul. Someone who is without money can find life difficult while someone with money can find his fears difficult. This is a lesson of the thoughts of Iyar. 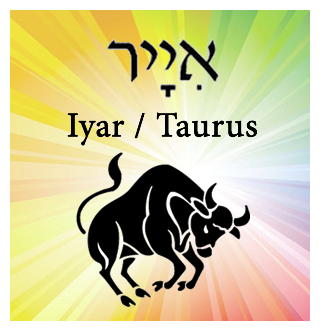 Zodiac Sign: Shor - Bull שור See below for information about the Zodiac sign of Shor. One hint is to realize that it is not the cow bull but the bulls of Africa. The water buffalo is an example. Tribal Flag: for Shimon is Green ירוק with the village of Shechem. Green is a central column color. This is an indication of the true power of Judgment. Judgment when we reach perfection is also perfect. Our positive actions become positive effects in our lives and in our world. May it happen today, as we all say Amen. Tribal Direction: West מארב Maariv The west is called "the place of blending" since it blends all essences as the Manifestation and Malchut. Iyar is called Chodesh Ziv in the Talmud. This translates as the month of light. We also know that every day of this month is a day of Counting the Omer which is considered a negative period. How do we reconcile this Month of Light with a negative period? This is actually the true essence of the month of Iyar. There is so much metaphysical energy during this month that we are unable to see the truth, behind this energy. Our Tikune is not finished. It is not completed. Yet with this much light we "feel" that everything is accomplished. This is the danger of the month of Iyar. We must strive to see how far we are from the Light when the light appears to be so close and full. The Hebrew word Iyar is an acronym for the phrase in Hebrew "I am HaShem your healer" אני יהוה רפאך. Iyar is spelled Aleph Yood Reish. Sometimes it is spelled with two Yoods but the spelling associated with the healing is based on the first letters of these three Hebrew letters: Aleph Yood Reish. To begin to understand the energy of Iyar we need to understand what it means to heal. When someone becomes ill it is an indication that they have gone out of balance. That is the true definition of illness and the need for healing is to bring one back to balance. How does one bring oneself back to balance? Balance starts with knowing who you are. What you are to do in this life and what is the spiritual work that one needs to do to bring yourself back to balance. This is not an easy task. It becomes easier when we use the tool Binding by Striking in our lives. It also becomes easier when the Light is more intense as it is during Iyar. The tool we call Binding by Striking is a lifetime learning process and relates to the consciousness we have when we actually do any action. Our reactive consciousness is always selfish. By stopping that reaction and changing our motivation or our consciousness of why we do what we do, we cause that action to become positive. The action can be the same as what our reaction was going to be. Yet our consciousness is very different. This is a short description of Binding by Striking. It is best to listen to the recordings for Class 5 and 6 of the basic course available on the Yeshshem.com website under the "Revealed Wisdom" link. These recordings are free of charge. Iyar is one of three months involved with the Light of the Torah. Pesach reveals the Light of the Torah without any issue of Bread of Shame. Bread of Shame is a Kabbalistic concept that relates to earning what pleasures we receive in this physical world. Light is another word for the fulfillment of our desires. When the Light of Pesach comes into the physical world during the Night of Pesach it comes "with a free lunch." The pleasure of the Seder is given to us for free without earning this pleasure. Of course, many people do not understand that the actions of the Seder are about pleasure and fulfillment and that is unfortunate. At the end of Pesach that Light of Pesach disappears. This disappearance is metaphorical since Light never disappears, it is just waiting for a vessel to receive it. During the period of the Counting of the Omer we are building our vessel in order to receive the Light of Torah/Pesach that we have earned. That is the energy of Iyar to cleanse and grow our vessels so that we can receive as much of the Light of Pesach as possible when it returns as the Light of the Torah in Sivan. Here are the letters of the month and the Tetragrammaton Permutation for the month of Iyar. Now let's look at the permutation of the Tetragrammaton for the month of Iyar and what we can learn. This permutation puts the Name of God in its normal, proper, and optimal placement to provide for the maximum flow of the Beneficence of HaShem. In essence the Yood, in the World of Atzilut, allows for a concentrated point of connection to the World of Ain Sof or Endless World. The upper Hey in Beria expands to support actual birthing and Creation. The Vav then channels this energy of Creation into the final Hey in the World of Malchut which is manifestation. When we look at the permutation for Iyar the last two letters are reversed in comparison to the regular order of the Tetragrammaton. This means that the Vav is bringing additional energy to the world of action - our physical world. This additional energy is flowing through the Hey which represents and expansive flow over the usual flow through the Vav in the World of Yetzirah. This is the reason that the Sages teach us that the month of Iyar is the month of healing. This healing comes from this stronger flow of energy which allows us to "see" more of where we are unbalanced. Of course, this only applies to those people who are open to see the flow of energy and to realize that this healing energy is available to them and to us. The letter Vav has two functions within the Hebrew Alef Bet. It serves as a connecting letter like the word "and" in English. The Vav also transforms the tenses of verbs. With the leading Vav the future tense becomes the past and the past tense becomes the future. We can see easily, by looking at a calendar, that Iyar connects the Omer period in Nissan to the Omer period in Sivan. These three months are connected through the Vav that created Iyar. It also created the Astrological sign of Shor which is "the bull." The nature of the bull is placid stubbornness. That is the nature of the people born in Iyar. They like their comforts and will not go out of their comfort zone no matter how uncomfortable the situation gets. The Pey is the letter that created the planet Venus. Rabbi Shabtai Donnelo in his commentary on the Sefer Yetzirah teaches what modern science is learning- that the cloud cover on Venus makes it very difficult to see the surface of the planet. It makes it difficult to know what is happening on in the lower levels of the planet. That is also the nature of the people born in Iyar as they seem to be unaffected by what happens around them. This comes from the large energy flow through the Tetragrammaton permutation discussed above; there is so much energy that everything seems "good" when it truly is difficult. The Pey also has a Bet within the letter Pey. This concealed Bet represents the energy of Blessing. The word Pey means mouth and this is also true of the period of Iyar. The healing comes as a Blessing providing one does actions that reveal this Blessing of Healing. It starts with using the Light of the Month to truly "see" ourselves. That is the true purpose of the Counting of the Omer ritual. We use our mouths to say the Counting of the Omer and this Blessing will work for us providing we are willing to change ourselves through our introspection as part of the Counting of the Omer. In this ritual we utilize the Hebrew Alef Bet to "SEE" inside ourselves by asking questions about these Hebrew words and letters and decide if we want to change various traits. To understand these insights of the Hebrew letters EXPERIENCE the Counting of the Omer using the tool on the Yeshshem Website in the link above. Together the two letters Pey and Vav spell the word Po which means "Here" as in a physical location. And that is the energy of the month - being in a location and being in your own physical space. The gematria of these two letters is 86 which is the gematria of the Name of God representing the attribute of Judgment. Judgment is the Light’s request for revelation. In other words, Iyar the Month of Light is an opportunity to discover through use of our judgment, something that was previously unknown to us. A good thing to do this month is to use your own judgment in learning what has not yet been revealed to you. In that situation Judgment is not something to fear but something to pursue. For human beings judgment is something that is usually feared. That is because judgment is actually the/a natural process of cause and effect. When one does a negative thing that becomes a negative cause which creates a negative effect. Since most actions that we humans do are negative, with the consciousness of selfishness we normally fear judgment. Yet we do not need to fear judgment when we trust in HaShem's Mercy. Mercy is the Energy of Miracles. Please learn the cosmic universal law to receive a Miracle one must go outside your normal path and comfort zone. Our comfort zone is something that changes as our life circumstances change. If something is difficult it is outside our comfort zone. If something is easy and comfortable it is inside this zone. The zone changes as an effect of our spiritual growth. Here is an example: Yesterday it was difficult to call and talk to my mother. Today i have forgiven her and we have healed so i enjoy speaking to her. Yesterday if i called her it means i am going outside my comfort zone. Today this call is within my comfort zone and i need to do more (something outside my comfort zone) to merit a miracle in my life. The energy of the number 86 (a number that is the gematria of the Name of God Elohim) is best expressed through two other words that have this normal gematria. One word is the Hebrew word for Nature הטבע and the other word is the Hebrew word הללו יה . Halluyah is usually translated as Praise. As can be seen by the way i spelled it in Hebrew it is also sometimes spelled with the meaning of Praise Yah or Praise God. Do Nature and Praise of Yah appear as opposites? Or do they actually seem to be two sides of the same coin? When we remember to Praise God during the month of Iyar we then bring the natural consequence of that appreciation which is the manifestation of nature in our lives. That manifestation should be joy and happiness, yet that only occurs when we have the vessel to reveal the Light during the month of Iyar. Another important lesson about the month of Iyar comes through the gematria of 86 which is the gematria of the 72nd Name of God. That name is מום . It is the vaccine against a Handicap or a physical ailment manifesting in our lives. The First Holiday in Iyar is one that is usually forgotten. In the past few years due to the internet, people have begun to recognize the date but don't know what to do about it. Pesach Sheini is the name of the Holiday. This translates as Second Pesach. It applied to people in Temple Times who were impure during the Holiday of Pesach during Nissan and were unable to participate in the Pascal Sacrifice and Seder. They had a second chance to purify their lives in order by being able to do the Seder (Pascal Sacrifice) during the month of Iyar when they were no longer impure. Pesach Sheini is related to the energy of a "second chance." That is what the energy of healing provides us - a second chance. To connect to this energy just eat a square or circle of Matzah on the 14th day of Iyar during one meal. It is an easy ritual and connects us to the energy of a second chance which is something we all need. This year the Holiday is on the evening of May 9 2017 and concludes at sundown on May 10 2017. We will have an internet and phone connection for this energy at ------------ PM Pacific Time. If you are interested please contact me to arrange the information on how to connect to our connection. The 33rd day of the Omer which happens on the 18th of Iyar is a very powerful Holiday that is truly very misunderstood. In Israel hundreds of thousands go to Meron the burial place of Rabbi Shimon Bar Yochai and start many bonfires and burn them all night. Some people teach that this is a day of celebration due to the ending of the fatalities of the 24,000 students of Rabbi Akiva who died during this period of the Omer. In Kabbalah we never celebrate a physical event; we are dealing with energy. The energy of this day is related to the Sefirah that is counted on that day - Hod SheBe Hod. Please note that the 24,000 students were reincarnations of the 24,000 members of the Tribe of Shimon who died during the Holocaust of Baal Peor spoken about in the Parasha of Balak. Hod is the Malchut of the spiritual worlds connected to Zeir Anpin. Therefore, Hod Shebe Hod is Malchut of Malchut dealing with the revelation of the Torah which is being revealed 17 days from now on Mt Sinai. What this means is the energy that is available during this day is the revelation of the Torah without the limitations that exist in physicality. Of course, this energy is spiritual and is not available in the physical world yet. This is why the Sage Rabbi Shimon Bar Yochai chose to leave the physical world on this day so that we could utilize his Light to be a channel between the spiritual and the physical worlds. The bonfires are representing that Light of this channel provided by Rabbi Shimon. This year Lag B'Omer occurs on the evening of the May 13 2017. We at Yeshshem will be having a late night study to connect to this energy starting at ---------- PM Pacific Time. We will use the writings of Rabbi Shimon in the Zohar to connect to his energy as a channel to connect to the spiritual energy of Hod She BeHod. Please contact me if you want to participate in this connection by either phone or internet video conference. It is important to note that Pesach Sheini is on Chesed SheBe Hod while Lag B'Omer is Hod SheBe Hod. What is the connection that both Holidays are involved with the Sefirah of Hod. It is important for all of humanity to start to learn and think in terms of the Sefirot since this is the language of HaShem. Why do these Holidays connect to HOD? We will speak of this on the two Holidays for those who are interested. There are also another two days of Holiday in Iyar. There is a disagreement among the modern Rabbis whether these days should be celebrated as secular or Energy - Religious Holidays. On the evening of the 18th day of the Omer (Netzach She Be Tiferet) is a day called Memorial Day and it is a commemoration of all of the people who have died throughout the centuries Kiddush HaShem - In the Holy Name of God. The next day which is the 19th day of the Omer (Hod She Be Tiferet) is the Holiday called Yom HaAtzma'ut. This is commemorating the start of the modern Independent state of Israel. Please review last year's discussion about the difference in the Jewish Calendar between the standard calendar and the Karraite Calendar. This does impact the date when the Modern State of Israel was declared. As a student of Kabbalah i do not celebrate these two days as relating to the physical acts and our Kabbalistic Rabbis have not decided if these are energy days that we should try to connect to. Every day in Iyar is considered a high energy day. Every day in Iyar is a day that we can use to cleanse ourselves in preparing for the revelation of the Torah on Shavuot. Here is a link to our Omer counting pages. Here is the link to the Tzadikim from Iyar. The Tribe for the month of Iyar is the Tribe of Issachar. I suggest you spend some time during this month checking out the attributes of the name Issachar and the Name of the Nasi who gave the dedication and his consciousness of why he gave what he gave. Remember not all of these attributes are positive and with the tool of Binding by Striking we can correct them and transform them into positive aspects. Here are strategies to adopt for this month of Iyar that will help keep you in balance. Yet remember the most effective tool to keep you in balance for Iyar is Binding by Striking. 1. There is no coincidence. The Torah speaks extensively about what is Kosher food during the month of Iyar. It is a good idea to be aware of the energy of the food that we eat. When animals are slaughtered in a manner that is not kosher their fear and emotions cause them to dump massive amounts of adrenalin into their bodies prior to death. Then don't eat non kosher meat. When you eat are you mixing the energy of continuity (milk products) with the energy of end (slaughtered animals)? 2. Make time to connect to God. Our healing is a function of our relationship with God. Do some additional Torah study. Prayer is one manner of connecting to God. We will be starting a class on prayer and the intention and direction of that Prayer within the frame of the spiritual system during the month of Iyar. Write to me for information about the class. 3. Go outside of your spiritual comfort zone. Healing comes from God. Miracles come from us when we go outside of our comfort zones. When you start doing additional "good deeds" (called Mitzvot) that is considered "going out of your comfort zone." 4. Tzedakah Saves you from Death. Giving additional charity during Iyar is a good practice to start or continue. This is because of the relationship that comes from HaShem's Mercy in giving people the opportunity to go out of their comfort zone and receive the miracle of a spiritual court negative decree of death or other harm being rescinded. When one gives Tzedakah one is going out of their comfort zone and thereby may earn the merit to receive a rescinded decree. This is HaShem's Mercy. This is the spiritual system that HaShem set up to sweeten the periods of judgment throughout the year. During Iyar the word healing actually means fulfillment of our desires. Someone in pain has a desire to relieve the pain. Someone who is ill has a desire to become well. Healing means your desires can be fulfilled this month. Often, we relinquish control of our lives to doctors, lawyers, and other “experts,” expecting them to heal our physical, financial, and emotional wounds, or somehow make everything well. However, true healing and fulfillment is our own responsibility. This spiritual truth is made more evident this month as the effulgent Light radiating in Iyar inspires us to seek healing and fulfillment from within. If your lunar north node is in the Zodiac sign of Taurus your Tikune is in Taurus. 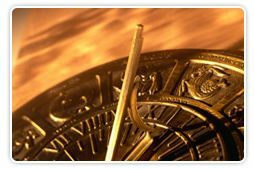 If you do not know where your north node is within your astrological chart send me your birth date and birth location and birth time to yeshshem@hotmail.com. I will send you information on how to find your north node and your personal Tikune. The Tikune is Taurus is one of the most difficult. By pushing away the coldness and darkness of your last lifetime as a Scorpion, you let in the light and approach the real goal of Loving your Neighbor as Yourself. Iyar and the Astrological sign of Taurus is not an easy period; it just feels and looks easy. That is the problem. There is not a lot of overt or obvious chaos during this period like there was in Nissan. Yet that is the illusion because the process is setting up the future chaos unless you do the proactive decisions. It is easy to delay and procrastinate during Iyar because it feels like everything is ok and doing fine. Yet we need to become proactive and realize that the spiritual work we do in counting the Omer and changing ourselves is what this period of no overt chaos is all about. Remember proactive behavior is doing Binding by Striking. Proactive behavior is stopping our reactions first. This is the spiritual work that will be difficult during Iyar because things will "feel" so comfortable.